Which water purifier is best for municipal corporation water in India? 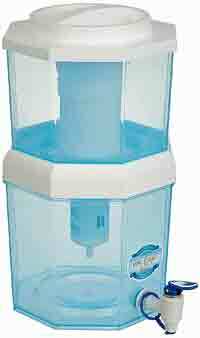 The safest water purifier to buy for use with tap water in the big cities of India would be an RO water purifier. Even though the quality of the tap water was excellent when it left the central water purification plants, the water supply pipelines are quite old with frequent leaks through which the water may get contaminated with germs. Also, these old pipelines may be made of materials which have heavy metals in them. 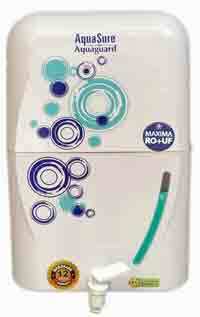 So an RO water purifier will be your best guarantee to get the safest drinking water possible. Some common search terms on the internet regarding water purifiers from India are: "best water purifier for Delhi Jal Board", "best water purifier for BMC water in Mumbai", "best water purifier to buy in Bangalore", etc. So it is clear that the people do not trust the Municipal or Corporation tap water supplies in Indian Cities. The tap water quality in big cities like Delhi, Mumbai, Bangalore, Chennai, etc. is being checked continuously at the purification plants to make sure that it meets the requirements of the Indian Drinking Water Standards BIS-10500. So water in the big Indian cities is basically very good. The problem is that on its way to your home or apartment, it may get contaminated by germs. The germs can get in through leaks in the pipeline or when water is stored in tanks. So you need a water purifier to make sure tap water is safe to drink. Below please find a list of recommended water purifier for home use in Delhi, Mumbai, Bangalore, etc. guaranteed to give germ-free water from Corporation or Municipal water in India. Each of the recommended water purifier in India in the list below is a clickable link which will take you down to a section with full details, including the price of the selected tap water purifier. 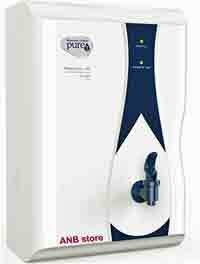 Best water purifier for Delhi Mumbai Bangalore etc. Our top three choice of water purifiers are all water purifiers that work without electricity. These are the latest and best non-electric water purifiers in India, working with adsorption technology. Adsorption is a process which works like magnets to remove all germs from water. Some of the selected best water purifiers may have activated carbon or similar mechanisms to remove some dissolved chemicals by adsorption. Gravity type water purifiers in the list may have chemical means to make sure the purified water is absolutly sterile without any germs. 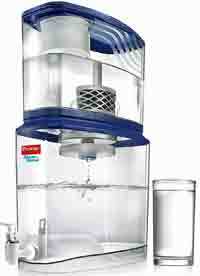 The last 3 water purifiers in our list of best water purifiers in India are RO water purifiers. These are some of the cheapest and good RO water purifiers in India. Municipal or corporation water in India will not have high dissolved salts or high TDS. Only disease causing bacteria. Hence an RO water purifier is not neccessary, but with an RO water purifier you can be absolutly sure that your drinking water will be safe. The disadvantages of RO water purifier is that it is expensive, it requires electricity to work and it wastes a little water. You must have noticed that we select water purifiers only from old established manufacturers of water purifiers or from well established Companies in India. This is because you can be sure to get service in your locality and also to be sure that these companies will be there when you need service. Details of how each water purifier works is given in the description of each selected water purifier below. 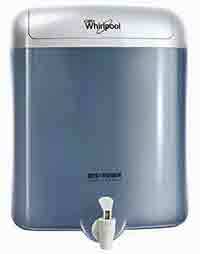 Whirlpool Destroyer World 61005 6-Litre Water Purifier claims it is as good as an RO water purifier for tap water containing less than 500 ppm TDS. The Whirlpool Destroyer Water Purifier works without electricity and is a wall mounted water purifier with 6 litres purified water tank. The special EAT filter element in the Whirlpool Destroyer Water Purifier can purify upto 2200 litres of water, after which it should be replaced. For a normal house with 2 adults and 2 children, the average drinking water usage for both cooking and drinking is about 15 to 20 litres. This means that each Whirlpool Destroyer Water Purifier EAT replaceable filter cartridge element should last for about 4 months. Ion-exchange resin which can remove heavy metal ions like that of Arsenic and Lead. Activated carbon which adsorbs and removes chlorine, organic chemicals like pesticides and endotoxins. The AquaSure Amrit water purifier works with a unique technology based static electricity charges on Aluminium Oxide Nano fibres which is inside the AquaSure Amrit water purifier. When water flows around these Nano fibers they become negatively charged and since bacteria and viruses are positively charged, all the viruses, bacteria, parasites and their eggs called cysts gets trapped within the Nano fibers, thus removing from water all bacteria and viruses. This unique water purifier thus purifies the water fast and since not much pressure is required, this gravity filter fills faster. Prestige Clean Home Water Purifier is a multi-stage water purifier which removes bacteria, viruses and parasites as per US-EPA guidelines and meets NSF 42 standard for safe drinking water. In addition, Prestige Clean Home Water Purifier get rid of suspended solids like dirt, bad odor from water and makes it taste better. This water purifier can achieve 99.9999% bacteria reduction, 99.99% water-borne virus reduction and 99.95% water-borne cysts reduction. It can also remove Chlorine Taste and bad smells in water. Also has the capability to adsorb some of the chemical contamination of water. Replaceable cartridge with long life of 1500 Liters. Multi Stage Purification through the Programmed Germkill cartridge ensures good pure drinking water. Auto Shut Off feature when the GermKill cartridge nears the end of its life. In an HUL Pureit Classic Water Purifier, the water is poured into the upper tank and the water flows by gravity into bottom purified water tank through a special water filter purifier cartridge. The special filtration cartridge in the Pureit Classic Purifier has a Microfibre Mesh which Removes larger particles of dirt, then a Compact Carbon Trap which removes harmful organic chemicals and then a Germkill Processor which has a 'programmed chlorine release technology' to kill all viruses and bacteria. This combined special filter cartridge in the Pureit Classic Water Purifier gives a very sterile germ free drinking water. Finally there is a Polisher cartridge which removes any trace of chlorine and its by-products to give great tasting water. We consider this to be a cheap and best RO water purifier in India and our top choice among Indian RO water purifiers because of its cheaper price and the pedigree of being a product from the reputed house of HUL (Hindustan Uni Lever). 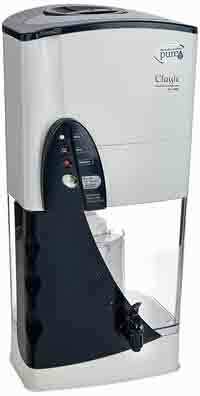 Kent Gold Optima 10-Litre Gravity Based Water Purifier is in our list of top best water purifiers in India for the following reasons: It is a ultra-filtration membrane based filter which actually filters out all germs and dirt in water. Ultra-filtration membrane has a pore size of 0.2 microns and since this pore size is smaller than the size of the smallest disease causing germ, the virus, it makes the water totally sterile and germ free. The fact that it is physically removing all germs in water is good, unlike in a UV water purifier where the UV light is supposed to kill the germs in water but does not physically remove the dead particles from the drinking water. Also in this water purifier the water flows over a nano-silver carbon filter which makes doubly sure that if at all any germ has by passed the ultra-filter membrane, then it will be killed. 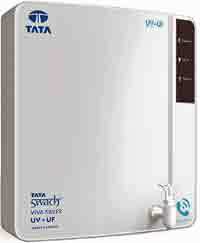 The Tata Swach Smart is a Gravity Based Water Purifier of 15-Litre capacity. The 15 Litres capacity is the total of the two tanks, raw water and purified water tank each, 7.5 liters. The purification technology in the Tata Swach Smart is based on Silver Nano-technology which is a sure way to kill bacteria and viruses without using electricity. 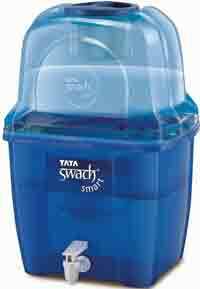 The heart of the Tata Swach water purifier is a replaceable cartridge called the 'Tata Swach Bulb'. Inside the Tata Swach Bulb there is activated Rice Husk Ash impregnated with Nano Silver particles. The combination of Rice Husk Ash (RCA) and nano-silver particles is an effective way to kill all bacteria, viruses and parasites in the water. The Rice Husk Ash (RHA) also contains activated silica apart from the activated carbon and this helps in making the water crystal clear by eliminating turbidity or cloudiness in the water. Activated Carbon also adsorbs most of the organic impurities, thus improving the taste of the water. 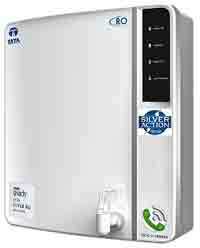 The Tata Swach Viva Silver UV + UF water purifier is a convenient wall mounted water purifier ideal for town tap water supply. Three good water purification technologies are included Nano-Silver, UF and UV, so you can be sure of good germ free water. In addition to what is there in normal RO water purifiers, the Pureit Classic Mineral RO + MF water Purifier has an additional Micro Filtration (MF) with assured bacteria killing power of their 'Germkill' cartridge which has a chlorine release technology to target and kill all harmful viruses and bacteria and provide pure drinking water. This acts as an additional assurance of safety towards microbe free pure drinking water. 'Germkill' in Pureit Classic Mineral RO + MF water Purifier meets stringent international standards of EPA (Environmental Protection Agency of USA) for microbiologically safe drinking water. Advanced dual RO+UF purification; Long Cartridge Life of 6000 litres; Energy Saving Mode. Eureka Forbes Aquasure Maxima RO+UF Water Purifier is perhaps the cheapest RO water purifier from a reputed manufacturer of RO water purifiers. This water purifier will do its job of giving pure drinking water, but it has no bells and wistles to show off. It is just a simple water purifier with just a small LED light to indicate whether it is On or Off. Well worth the money. This RO water purifier is perfect for a small family and is a cheap and reliable RO water purifier made by the trusted Tata Group.